Being completely silent and fully present in the moment, being perfectly immersed in prayer or in any relationship, is hard work! “How rare the moment and how brief the duration,” Nelson Thayer, my meditation teacher in seminary, often said. He was referring to that moment in prayer or meditation when distractions let go and we experience true silence and perfect presence in God. As soon as we recognize the experience, though, it’s gone. “There I am, wasn’t I,” Nelson would say. After my ruminations last week about presence, someone told me how hard it is for her to be fully present in prayer. A continuing stream of distractions is always pulling her away from her focus. That’s my experience, too. Whether my focus is my breath, a word or passage of scripture, or something visual like a natural object or an icon – or a conversation or a task I’m trying to complete – more distractions than I can count vie for my attention. So the third pillar that supports my faith, attentiveness, is as slippery as the first two, silence and presence. I know I can be truly present to God only here and only now, yet my mind is constantly wandering off to some other place or time. I used to struggle against distractions, bearing down and trying harder to keep my attention focused. But the harder I tried to be attentive, the more my attention drifted, until I accepted the reality that being distracted is part of my human condition. It’s almost impossible to be completely attentive to anything, at least for more than a moment. Then I learned that the important thing about attentiveness is not that I stay undistracted; the important thing is that when I am distracted, I recognize it and bring my attention back to my focus. Do you know that a commercial airliner – or any airplane, for that matter – is on course less than two percent of the time? Ninety-eight percent of the time, the airliner you’re on is off course, yet still it gets to its destination. The way it does that is by making constant, small course corrections. The crew and navigation systems recognize when the airplane is off course, and they make the necessary corrections to get back on course. The history of our faith is like that. The Hebrew scriptures are one long story of how God chose a people and sent them off to a magnificent future in the promised land; how the people wandered off, distracted by the lure of false gods and their own judgments about life; how God went after them and brought them back; and how, time after time, they repeated the pattern of wandering off and being brought back, going astray and returning. Nelson Thayer kept stressing that success in prayer and meditation – and, I might say, success in a life of faith – is not in staying perfectly focused, perfectly faithful. It’s in recognizing when distractions take us off course and in gently letting go of the distraction and returning to our focus. It’s ancient wisdom that Isaiah heard when God said, “In returning and rest you shall be saved” (Isa. 30:15). The healing of our relationship with God and our neighbors is not in maintaining that relationship perfectly; the healing is in continually repeating the process of recognizing when we have drifted away and then returning, the rhythm of recognizing our distractedness (our sin), repenting (changing directions), and coming home, a pattern we repeat ad infinitum in our journey toward perfection (Heb. 6:1). 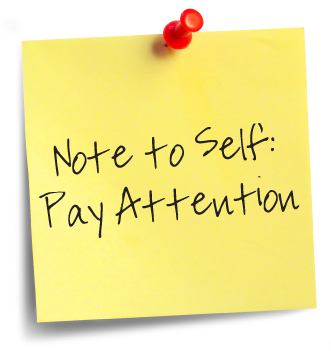 Amid all the distractions that pull us away from our center in God, there are many ways to improve our attentiveness. One of the best ways I’ve found is to stop multitasking and focus on the one thing at hand in the moment. Studies show that multitasking decreases our efficiency at work, diminishes our memory and ability to concentrate, and harms our health. Stop letting your mind scatter in many directions, and focus on the one thing of the moment, whether it’s a task, a person, or an experience. It’s in the particulars of the moment where we find God. Do that not only with your moments but with your days. “Finish one day before you begin the next,” Emerson advised, “and interpose a solid wall of sleep between two.” In your prayer at night, release all the day’s mistakes, all your unfinished business, all your anxiety for tomorrow, and your own soul into God’s care. And start the next day remembering that God’s “mercies never come to an end; they are new every morning” (Lam. 3:22-23), as sure as the sunrise. You can improve your attentiveness to life by creating your own version of praying the hours, the ancient practice of stopping and praying at specific times during the day – upon rising, at noon, at evening, and at bedtime, for example. The prayers needn’t be long and involved, perhaps only the reciting of a psalm or canticle from scripture or some other prayer, couched in a few moments of attentive silence. The framing of the day in regular times of prayer will help you recognize when your attention has strayed from God and will help you return. And praying with others in a small group where you hold each other accountable, in love, and encourage one another in your faith – this will do wonders to deepen your awareness and focus your attentiveness in your life with God and the world. That’s why the author of the Letter to the Hebrews wrote, “let us consider how to provoke one another to love and good deeds, not neglecting to meet together, as is the habit of some, but encouraging one another, and all the more as you see the Day approaching” (Heb. 10:25). Jesus said the first rule of life is to love God with all your heart, soul, mind, and strength; it is to focus all the energies and resources you have in open, receptive, single-minded attention to God (Mark 12:28-30; Luke 10:25-28; Matt. 22:34-38). That’s hard work, and lots of things will try to distract us from it. But it’s work made easier and more effective when we join in it with the companions we have in the spiritual journey. Prayer — Ever-present God: How can this flagrant wanderer begin to give my full attention – heart, soul, mind, and strength – to you in whom I live and move and have my being? And almost as quickly as I frame the question, you remind me it’s in the wanting to and in the trying to again and again, like that widow pounding on the sleeping judge’s door till my knuckles bleed if that’s what it takes. I’m thankful that if you are a jealous God, you are also an encouraging God, and a helping God, and that you are full of patience, so very much patience with us, that even the little attentiveness we can muster, if we’re trying, is enough.